Today’s post marks the start of a new blog series, called “Ask a…” where we’ll be interviewing different people about their lives and experiences. Due to our home base being Beijing, we’ve decided to launch the series with Ask a Beijinger! Our guest is my good friend Serene and I’ll let her tell you more about her life as a Beijinger! Serene, how long have you been in Beijing? 9 + 5.5 years! I grew up in Beijing from ages 9 – 18 since my dad worked here and then I graduated high school and left for university. After I graduated from university I came back to Beijing for round 2! What do you do in Beijing? What’s your favorite thing about living in Beijing? The people I have met and built friendships here and I love that it feels like I’m living in China especially because I can see bits and pieces of historical China in Beijing – Great Wall, Forbidden City, Summer Palace, Temple of Heaven etc. 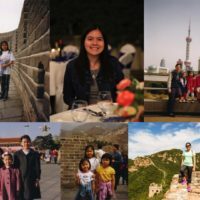 What’s something you wish someone would have told you before moving to Beijing? That I would be surprised on all levels so much more than expected when moving back even though I’ve lived here for 9 years before! I can’t imagine! Even in under 2 years I feel like I’ve seen Beijing change so much. What’s the biggest change you’ve witnessed during your time here? The development of the city, the number of subway lines, buildings, shopping malls etc. that have increased during my 5+ years here and also the ‘clean up’ of old parts of Beijing (removal of hutongs, debrickening of the Sanlitun alleys) for this city’s development. I think living in such a constantly changing place does impact each of us. What’s the biggest way you’ve changed since being here? I have let go and released control way more since being back in Beijing. The only constant is change here and I’ve learnt to roll with the punches a lot more and to be open to things panning out differently than expected. What’s a must see/eat/do in Beijing – or more than one of each? I think you have just given me some plans for the next long weekend, thanks! While those are some awesome things, I know it’s not always easy to live as an expat. What’s the hardest thing about living in Beijing? The air pollution – it does tend to limit the amount of outdoor activities and time spent outside and the turnover of Beijing – people come and go all the time. On the flip side of that, what’s been your favorite China experience? Watching fireworks go off on Chinese New Year around the Beijing from a rooftop of an apartment building. As a huge international city, the variety of food options is nearly limitless. What are some of your favorite restaurants in Beijing? What’s your favorite thing to do on a Saturday in the city? Meeting up with friends either for meals, hanging out at the park, watching a movie or exploring a part of Beijing! As a practical note to be able to experience all of these things, what do you think is the best form of public transportation around Beijing? If you want to avoid traffic: subway but if you’re not in a rush – then bike or bus! In the fall when Beijing is the most beautiful, I love riding a rickshaw to travel for short distances. To round out this conversation, you’ve given us some really great ideas for life in Beijing and I think sharing these experiences can only make them better! So what are some ways you’ve found to meet people here and build friendships? The Embassy – a young adults congregation that is a part of BICF City Church. The service meets every Thursday and is a great platform to meet people and organize hangouts with outside of Thursdays. My roommate and I also love hosting people for movie or game nights and festive events (Canadian Thanksgiving, celebrating Canada Day/4th of July, Christmas media marathons) at our apartment which has been a great way to get to know people more! Well Serene, thank you so much for taking the time to share your experiences as a Beijinger with us! I know I definitely have some new places to check out! Do you have any thoughts or questions on life in Beijing? Post in the comments below and we’d love to get back to you! Great interview! Serene is a go-to person for how to thrive in Beijing, thanks for sharing your insights and experiences.